This article is about cross-country skiing in general. For the sport of competitive cross-country skiing, see Cross-country skiing (sport). Cross-country skiers in western Norway. Cross-country skiing is a form of skiing where skiers rely on their own locomotion to move across snow-covered terrain, rather than using ski lifts or other forms of assistance. Cross-country skiing is widely practiced as a sport and recreational activity; however, some still use it as a means of transportation. Variants of cross-country skiing are adapted to a range of terrain which spans unimproved, sometimes mountainous terrain to groomed courses that are specifically designed for the sport. Michal Malák skate-skis at a qualifier for the Tour de Ski, 2007. In contrast, alpine skiing is referred to as stå på ski (literally "stand on skis"). 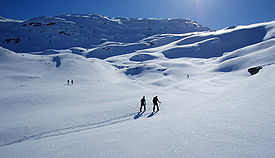 Recreational cross-country skiing includes ski touring and groomed-trail skiing, typically at resorts or in parklands. It is an accessible form of recreation for persons with vision and mobility impairments. A related form of recreation is dog skijoring—a winter sport where a cross-country skier is assisted by one or more dogs. Cross-country ski competition encompasses a variety of formats for races over courses of varying lengths according to rules sanctioned by the International Ski Federation (FIS) and by national organizations, such as the U.S. Ski and Snowboard Association  and Cross Country Ski Canada. It also encompasses cross-country ski marathon events, sanctioned by the Worldloppet Ski Federation, cross-country ski orienteering events, sanctioned by the International Orienteering Federation, and Paralympic cross-country skiing, sanctioned by the International Paralympic Committee. Swede Anna Haag with classic technique in the women's 10 km classic race at the 2011 FIS Nordic World Ski Championships in Oslo, Norway. The FIS Nordic World Ski Championships have been held in various numbers and types of events since 1925 for men and since 1954 for women. From 1924 to 1939, the World Championships were held every year, including the Winter Olympic Games. After World War II, the World Championships were held every four years from 1950 to 1982. Since 1985, the World Championships have been held in odd-numbered years. Notable cross-country ski competitions include the Winter Olympics, the FIS Nordic World Ski Championships, and the FIS World Cup events (including the Holmenkollen). Skiers employing step turns, while descending during a 2006 FIS World Cup Cross Country competition in Otepää, Estonia. Cross-country skiing has two basic propulsion techniques, which apply to different surfaces: classic (undisturbed snow and tracked snow) and skate skiing (firm, smooth snow surfaces). The classic technique relies on a wax or texture on the ski bottom under the foot for traction on the snow to allow the skier to slide the other ski forward in virgin or tracked snow. With the skate skiing technique a skier slides on alternating skis on a firm snow surface at an angle from each other in a manner similar to ice skating. Both techniques employ poles with baskets that allow the arms to participate in the propulsion. Specialized equipment is adapted to each technique and each type of terrain. A variety of turns are used, when descending. Pre-1940 ski gear in Oslo: bamboo poles, wooden skis, and cable bindings. Cross-country ski equipment for skate-skiing (left) and classic-style skiing (right). Ski and pole lengths are different for each. Classic skis have a "grip zone" in the area under the binding. Cross-country ski boot and standardized binding system for classic skiing. The skier clicks the toe of the boot into the binding and releases with the button in front of the boot. Standardized system: Boots and bindings have an integrated connection, typically a bar across the front end of the sole of the boot, and platform on which the boot rests. Two families of standards prevail: NNN (New Nordic Norm) and SNS (Salomon Nordic System) Profil. Both systems have variants for skiing on groomed surfaces and in back country. These systems are the most common type of binding. Three-pin: The boot-gripping system comprises three pins that correspond to three holes in the sole of the boot's toe, used primarily for back-country skiing. Cable: A cable secures the free-moving heel and keeps the toe of the boot pushed into a boot-gripping section, used primarily for back-country and telemark skiing. An early depiction of a skier—a Sami woman or goddess hunting on skis by Olaus Magnus (1553). Loyal retainers transporting Prince Haakon IV of Norway to safety on skis during the winter of 1206—1869 depiction by Knud Bergslien. A skate-skier in Gatineau Park, Quebec, a North American groomed-trail ski venue. A recreational cross-country trail, groomed for classic skiing only, in Tyrol. A blind cross-country skier with guide at a regional Ski for Light event. Dog skijoring—dogs provide added propulsion to the cross-country skier. ^ Hampel, Ian (1988). Australian Cross Country Skiing. Kangaroo Press. ISBN 9780864171993. ^ Broadbent, James (2004). New Zealand Backcountry Skiing. New Zealand Alpine Club. ISBN 9780958242134. ^ a b c Kunnskapsforlagets idrettsleksikon [Encyclopedia of Sports] (in Norwegian). Oslo: Kunnskapsforlaget. 1990. ISBN 82-573-0408-5. ^ a b Hindman, Steve (2005). Cross-Country Skiing: Building Skills for Fun and Fitness. Seattle: The Mountaineers Books. p. 264. ISBN 978-0-89886-862-3. ^ Editors. "Ski". Merriam-Webster's Dictionary. Encyclopædia Britannica. Retrieved 2014-10-21. ^ "Ancient Ice Sports". Shanghai News and Press Bureau. Archived from the original on 22 May 2012. Retrieved 1 January 2012. ^ a b c d e Saur, Lasse (1999). Norske ski: til glede og besvær (Research report). Høgskolen i Finnmark. ^ Birkely, Hartvig (1994). I Norge har lapperne først indført skierne. Idut. ^ Vaage, Jakob (1955). Milepeler og merkedager gjennom 4000 ar (in Norwegian). Ranheim: Norske Skiloperer Ostlandet Nord Oslo. p. 9. ^ Lund, Morten (Winter 1996). "A Short History of Alpine Skiing". Skiing Heritage. 8 (1). Retrieved 2015-06-29. ^ Hergstrom, P (1748). Beschreibung von dem unter schwedischer Krone gehörigen Lappland (in German). Leipzig: von Rother. ^ a b c Berg, Karin (1993). Ski i Norge (in Norwegian). Oslo: Aventura – Skiforeningen. ISBN 82-588-0951-2. ^ Magnus, Olaus. "Historia de Gentibus Septentrionalibus". Retrieved 2012-09-25. ^ a b Bergsland, Einar (1946). På ski. Oslo: Aschehoug. ^ Needham, Richard (1979). Ski Magazine's Encyclopedia of Skiing. New York: Harper & Row. p. 452. ISBN 978-0-06-014006-9. ^ de La Tocnaye, Jacques (1801). Promenade d'un Français en Suède et en Norvège (in French). Brunswick: P.F. Fauche et Cie.
^ Bø, Olav (1993). Skiing throughout history. W. Edson Richmond (trans.). Oslo: Samlaget. ^ Bengtsson, Bengt Erik. "Cross-country skating: How it started". Skiing History Magazine. International Skiing History Association. Retrieved 2014-10-20. ^ a b Editor (2010). "Marathon Skate". Cross Country Ski Tips and Information. XCSki.com. Retrieved 2015-06-29. ^ Nansen, Fridtjof. Paa ski over Grønland. En skildring af Den norske Grønlands-ekspedition 1888–89. Kristiania: Aschehoug. ^ Nansen, Fridtjof (1890). The first crossing of Greenland. London: Longmans, Green and Co.
^ Nansen, Fridtjov (1891). Auf Schneeschuhen durch Grönland. Hamburg: autorisirte deutsche Uebersetzung von M. Mann. ^ a b Vaage, Jacob (1952). Norske ski erobrer verden. Oslo: Gyldendal. ^ "Nynorskordboka og Bokmålsordboka" (database search). Språkrådet (Language Council of Norway) and University of Oslo. Archived from the original on 21 September 2014. Retrieved 14 October 2014. ^ Follestad, Sverre (1993). Engelske idiomer. Ord og vendinger fra norsk til engelsk. Oslo: Kunnskapsforlaget. ^ Kirkeby, Willy A. (1998). English-Norwegian Dictionary. Oslo: Universitetsforlaget. ^ A Complete Guide to Alpine Ski Touring Ski Mountaineering and Nordic Ski Touring Including Useful Information for Off Piste Skiers and Snow Boarders. Authorhouse. 2014. p. xvii. ISBN 978-1-4918-8808-7. ^ Volken, Martin; Schnell, Scott; Wheeler, Margaret (2007). Backcountry Skiing: Skills for Ski Touring and Ski Mountaineering. Mountaineers Books. p. 12. ISBN 978-1-59485-038-7. Retrieved 2014-07-12. ^ Editors (2015). "DNT routes". Routes and cabins. The Norwegian Trekking Association. Retrieved 2015-06-29. ^ Thomson, Jim (November 2009). "A Technical Manual for the Organization of Cross Country Ski Events". Officials' Manual Version 3.4. Cross Country Canada. Retrieved 2014-10-21. ^ Kunnskapsforlagets idrettsleksikon [Encyclopedia of Sports] (in Norwegian). Oslo: Kunnskapsforlaget. 1990. p. 197. ISBN 82-573-0408-5. ^ Directors (2012). "Cross Country Sport Committee". USSA Programs. U.S. Ski and Snowboard Association (USSA). Archived from the original on 5 November 2014. Retrieved 4 November 2014. ^ Directors (2012). "Rules and Regulations". Cross Country Ski Canada. Retrieved 2014-11-04. ^ Editors. "FIS History". About FIS. International Ski Federation. Retrieved 2014-10-23. ^ Nilsson, David (2015). "Visma Ski Classics". Retrieved 2015-12-15. ^ a b Editors (2012). "What is Worldloppet?". Worldloppet Ski Federation. Retrieved 2014-10-23. ^ IBU Congress (2012). "IBU Event and Competition Rules" (PDF). Rules adopted by the 2012 10th Regular IBU Congress. International Biathlon Union. Archived from the original (PDF) on 23 September 2015. Retrieved 29 June 2015. ^ Editors (2011). "Ski Orienteering". International Orienteering Federation. Retrieved 2015-06-29. ^ IPC (2013). "Nordic Skiing Classification". IPC Cross-Country Skiing and Biathlon. International Paralympic Committee. Retrieved 2014-10-04. ^ a b c d e f g h i j k Rees, David (1981). Cross-country skiing: touring and competition (3d ed.). Toronto: Copp C. Pitman. ISBN 978-0-7730-4045-8. OCLC 300405310. ^ a b Hindman, Steve (February 2004). "Poling Principles". Training & Technique. Cross Country Skier. Archived from the original on 29 November 2014. Retrieved 18 November 2014. ^ Hindman, Steve (December 2008). "Technique & Training: Three steps to skating". Cross Country Skier Magazine. Archived from the original on 17 October 2014. Retrieved 20 October 2014. ^ "Swedish Olympic Champion Recalls the Early Development of Skate Skiing – Cross Country Ski Technique". Retrieved 2019-02-18. ^ a b PSIA Standards Committee (June 2014). "Cross Country Certification Standards 2014" (PDF). Professional Ski Instructors of America. Retrieved 2014-10-22. ^ Fabricant, Florence (26 January 1999). "The Novice; Mastering the Practical Curtsy, on Skis". The New York Times. Retrieved 2014-10-21. ^ Hindman, Steve (2003). "Going Downhill". Training & Technique. Cross Country Skier Magazine. Archived from the original on 23 October 2014. Retrieved 21 October 2014. ^ "Cross Country Skiing Equipment and History". International Olympic Committee. Retrieved 2014-10-11. ^ "Cross Country Skis (Nordic Skis)". MEC. Mountain Equipment Coop. Retrieved 2014-10-19. ^ Bergin, Ron (2008). "Back to Basics: A Quick Look at Paste Waxes, Waxless Ski Preparation and Kick Waxing". Archived from the original on 2 April 2007. Retrieved 2009-01-25. ^ Recreational Equipment, Inc. (2015). "Cross-Country Ski Gear: How to Choose". Retrieved 2015-06-29. ^ Editors (2 September 2013). "How to choose the right ski length". Back Country. Retrieved 2014-10-22. ^ a b Melbye, Mats (1997). Friluftsliv i vinterfjellet. Oslo: Universitetsforlaget. pp. 31–32. ISBN 82-00-42088-4. ^ Harvey, Ian (9 February 2011). "Information on Fluorinated Waxes". A Michigan Nordic Ski Racer. Retrieved 2014-10-21. ^ Swix (22 February 2011). "Information on Fluorinated Waxes". A Michigan Nordic Ski Racer. Retrieved 2014-10-21. ^ a b Dzierzak, Lou (November 2008). "Cross country skiers venture off track". On the Wild Side. Cross Country Skier Magazine. Archived from the original on 2 March 2015. Retrieved 21 October 2014. ^ Brugge, Mette (December 20, 2015). "Skistavens historie: Hjelpemiddel og bråkmaker". Aftenposten (in Norwegian). Oslo. p. 14. Retrieved 2015-12-22. Wikimedia Commons has media related to Cross-country skiing. Wikivoyage has a travel guide for Cross-country skiing. Tutorial on the snowplough or wedge turn. Tutorial on the stem or wedge christie turn. Tutorial on the Telemark turn. Tutorial on the step turn.